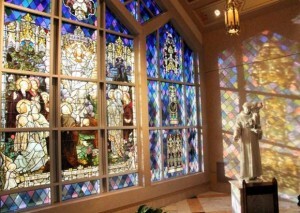 Many of the stained glass windows and statues of St. Mary Magdalen came from closed Catholic churches in Philadelphia. 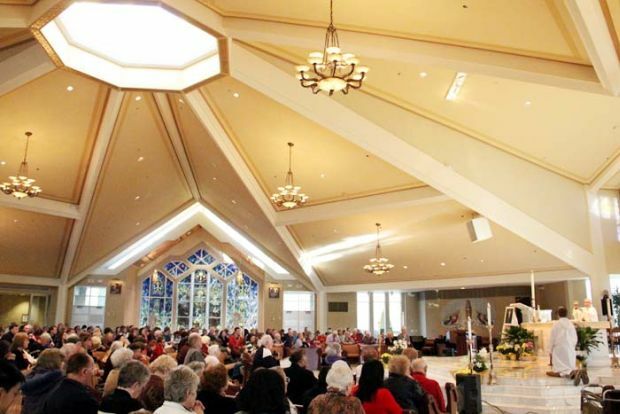 St. Mary Magdalen Parish in Media, Delaware County, has certainly come a long way in 50 years. With Father Gilbert J. McDevitt as founding pastor in 1963 it started with 156 families drawn from Nativity B.V.M. in Media and St. Anastasia in Newtown Square, worshiping in a converted barn. Now with Msgr. Ralph Chieffo as the fifth pastor, it is worshiping in its third church, dedicated in 2008. And the congregation has grown to 1,700 families including 98 new families last year, totaling 6,500 people. 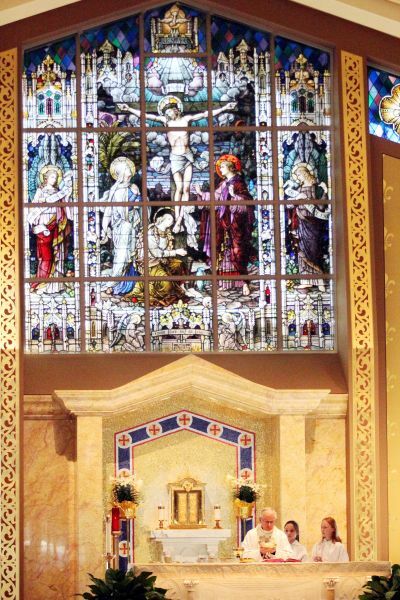 When Archbishop Charles Chaput visits on Sunday, Sept. 29 for the anniversary Mass, it will be in a clearly contemporary church designed by parishioner William F. Murphy yet one where the past has been seamlessly blended in. Whether it be beautiful statuary from St. Clement Church or King of Peace, or stained glass from St. Alphonsus — all closed Philadelphia churches — or artwork acquired by the second pastor Msgr. Richard Simons and more recent acquisitions by Msgr. Chieffo, it all blends in symphony both in the main church and the adoration chapel. After the church was completed in 2008, it was paid off in full within six months, according to Msgr. Chieffo. But ultimately it is not the vibrancy of the church architecture that makes St. Mary Magdalen a great parish; it is the vibrancy of the people and the multitude of programs. “It’s one thing to build a beautiful church, it’s another to build a prayerful spirit and a family of faith,” Msgr. Chieffo said. Part of that is the parish commitment to education best exemplified by the parish school. With 390 students, it is three times the number of kids in the Parish Religious Education Program, a ratio that oftentimes is the exact opposite in many parishes. But the PREP religious education is also valued – the teachers are paid professionals, not volunteers. Patricia Miniszak probably knows more about the school than even Msgr. Chieffo. A parishioner for 26 years, she has been a teacher, the school principal and now its president. Recruitment starts at baptism; the parish sends a congratulatory card and this continues annually until the child is school age. Also Miniszak works with an advisory board, cultivates alumni interest, and school tours are conducted for prospective parents. And of course there is word of mouth from satisfied parents. “This is a thriving parish and people do get involved,” Miniszak said. She points to the daily Mass with an attendance of about 80 as indicative of the spiritual health of St. Mary Magdalen, as well as the perpetual adoration that is conducted throughout the week beginning at 1 p.m. Sunday and ending at 8:30 a.m. Saturday, a day when there might be several weddings and of course the weekend liturgies. Special Masses for the students are so well attended there is no room for the parents, Miniszak said. The youth of the parish are also served through a CYO program for grades five through 12, which isn’t just athletic teams – the five phases of ministry cover athletic, social, cultural, service and spiritual life. For the sick and the elderly there is a whole army of volunteers to conduct home visitation or ministry at the four nursing homes in the surrounding area. Then there is Oasis of Peace, an orphanage ministry in Kenya that the parish helps fund. St. Mary Magdalen also makes donations to schools in the Philadelphia Archdiocese, including Our Mother of Sorrows/St. Ignatius School in Philadelphia and Blessed Virgin Mary School in Darby. There are also no less than 40 ministries and services listed in the parish bulletin.